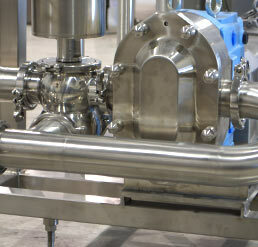 Advanced Stainless provides custom solutions for a wide range of industries. Architectural work often requires specific customized components in order to get the job done. Architectural structures are built for strength. Excellence in design creates beauty. Each job is unique and our clients look to our team to provide custom components to achieve their goals. Being certified to weld stainless structures through CWB gives our clients a reason for choosing Advanced Stainless. We partner with building and process engineers, architectural firms and designers. We are flexible and will work with your team or select a team of professionals for your unique project. We are able to provide fabricated components for predetermined plans or work directly with our partners to design and produce custom solutions to meet your demands. We are well known for delivering products that surpass expectation. We are able to design in Solidworks and Autocad, cut and shape using CNC machines, weld and polish using only the latest technologies and products. We are proud of our work and we employ the technologies that help us achieve the highest quality. We develop and build in our factory, enabling us to control the environment and maintain the level of excellence we require.